A Fully RECONDITIONED, RH / Passenger's Side, Mercury Capri Headlight Lift Motor / Capri Headlight Lift Motor originally manufactured by "HELLA". 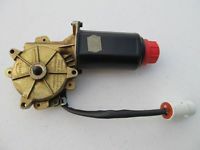 This Mercury Capri Headlight Lift Motor / Capri Headlight Lift Motor is being sold at a major discount of about 60% BELOW Ford's last list price of more than $660.00 each. **PLEASE NOTE: Mercury Capri Headlight Lift Motor / Capri Headlight Lift Motor uses a BLACK RUBBER DUST / DIRT BOOT which fits over the red "knob". This BLACK RUBBER DUST / DIRT BOOT can be purchased, New or Used, separately via the drop-down ordering menu at the specified prices. 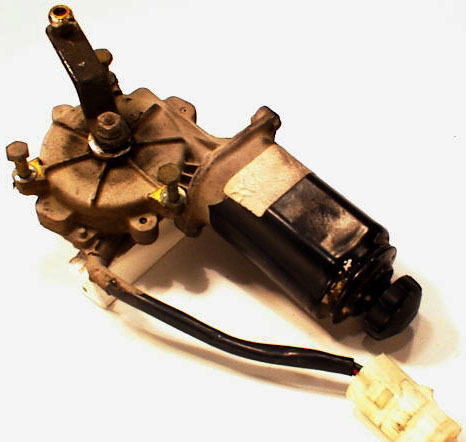 This Mercury Capri Headlight Lift Motor / Capri Headlight Lift Motor has an additional 100% REFUNDABLE, $50.00, "core" deposit will be added to your invoice at the time we process your credit card. This Mercury Capri Headlight Lift Motor / Capri Headlight Lift Motor Core Deposit will promptly be REFUNDED upon receipt of your complete old Mercury Capri Headlight Lift Motor if received within 30 days of original receipt. (*) KINDLY NOTE: Mercury Capri Headlight Lift Motors that are incomplete, disassembled, wires cut and/or spliced, and or have broken/stripped/worn worm gear teeth are not eligible for a core deposit refund; if your headlight lift motor runs, but the shaft either 1) does not move or 2)"clicks", your motor's worm gear is broken/stripped/worn and therefore is ineligible for a core deposit refund. Application: All Mercury Capri models including the XR2/Turbo - 1991, 1992, 1993, 1994 New Mercury Capri headlight lift motor, 1991 New Mercury Capri headlight motor / Capri headlight motor, 1992 New Mercury Capri headlight motor / Capri headlight motor, 1993 New Mercury Capri headlight motor / Capri headlight motor, 1994 New Mercury Capri headlight motor / Capri headlight motor. 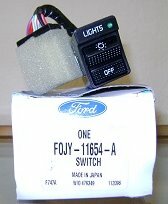 For ease or identification purposes the last original Ford part number for this NEW Mercury Capri Headlight Lift Motor / Capri Headlight Lift Motor was: FOJY13A167A / FOJY-13A167-A, F4JY13A167A / F4JY-13A167-A: 1991 /91 Mercury Capri Headlight Lift Motor / Capri Headlight Lift Motor, 1992 / 92 Mercury Capri Headlight Lift Motor / Capri Headlight Lift Motor, 1993 / 93 Mercury Capri Headlight Lift Motor / Capri Headlight Lift Motor, 1994 / 94 Mercury Capri Headlight Lift Motor/ Capri Headlight Lift Motor. * Please Note: These Mercury Capri Headlight Lift Motor / head light lift motors have been professionally "reconditioned" (NOT rebuilt/re-manufactured) per se in the following ways: 1) Each Mercury Capri Headlight Motor has been fully bench tested, and the electrical connectors have been cleaned and lubricated. 2) Each Mercury Capri Headlight Motor has been inspected and any broken parts have been replaced. 3) Each Mercury Capri Headlight Motor has been painted to help resist corrosion. However, these Mercury Capri Headlight Motor are still considered "used" per se. Consequently in accordance to stated our policies, there is no guarantee or warranty, whatsoever, on these Mercury Capri Headlight Lift Motors. Please browse the Modern Capri Parts catalog for all your 1991 mercury capri parts, 1992 mercury capri parts, 1993 mercury capri parts, and 1994 mercury capri parts needs. (*)IMPORTANT CORE RETURN RETURN POLICY: Core returns MUST be received by us within 30 days from your date of receipt. Therefore as per our store policies, your headlight motor core must be received within 30 days from the purchase date or the core deposit will be forfeited. If this return time frame criteria is not followed/observed, and you return a core after this 30 day period, we are NOT responsible for paying for the return shipping charges. Therefore, if the customer wants said core returned, he/she must notify us within five (5) business days of our notification to them of core refund ineligibility, and provide us (within the same five (5) business day period) with a money order / cashier's check in the amount of the S & H charges, as per their original sales order including the additional non-negotiable $16.00 shipping surcharge, PLUS a non-negotiable $25.00 administrative fee. We will advise you of said total amount due, and the mailing address at the time of your return request. Upon receipt of your return shipping payment, we'll promptly ship the core back to the original address (unless notified otherwise) per the respective shipping method (i.e. : USPS, FEDEX Ground, etc.). Finally all cores must be returned (complete) within 30 days from the purchase date or the core deposit will be forfeited. ***Buyers/Customers are responsible for paying all shipping costs associated with returning the core. If a customer attempts to return a core fraudulently using our FEDEX account number to avoid paying said shipping charges ( i.e. fraudulently returning the core in the original box to FEDEX as "Refused" (FEDEX Decal on box), the core deposit will be forfeited and this will be reported to FEDEX. Please refer to store policies regarding RETURNS of any kind. Special order items are non-cancellable, Electrical Parts are non-returnable and carry no warrantee or guarantee....."All Sales Are Final" / "As Is". Any and all returns must be pre-authorized and the customer must obtain a Return Authorization Number ("RAN").